I am sometimes ok with organizing things when it comes to my home, but the ugly wires behind my TV drive me crazy. In my house we have 3 different video game consoles, surround sound system, an antenna (Yes we have an antenna for our HDTV. Yes we decided to get rid of our cable), and an internet streaming device. Doesn’t sound too bad right? That’s a lot of wires to keep hidden and organized, but many people don’t know where to start. Look into wall mounted cabinets designed specifically to help keep your media room organized. These cabinets can store and manage an abundance of cables, and they are also designed with the proper amount of ventilation and cable entry points to keep your devices from overheating. Media armoires are also great to hide gadgets and to allow unsightly holes and ventilation areas to not be seen from any angle of the room. If you already have an entertainment center, consider drilling holes in the back of the cabinets and safely run wires through the holes. Contact a cabinet dealer in your area to get an expert recommendation. Many of them offer custom solutions for this type of project. Step 1: Start from scratch. 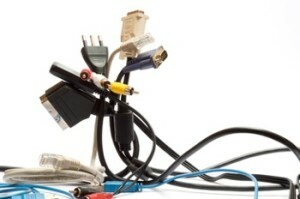 Unplug everything, and pull it all on one side of the room. (Dust, because you know it hasn’t been touched in a while). Step 2: Decide where you are going to set everything up. Don’t start plugging things in until everything is in its place. Step 3: Plug the outlets into the surge protector. Then plug in the other ends to the entertainment devices. Step 4: Label your cables. Step 5: Use items like cable clips, zip ties, twist ties and/or Velcro. I have found that some of the common household or office supplies can work for this. Bundle like wires together once you’re finished with step 4. Tie down long wires and hide them toward the back of the entertainment center or cabinets. On the backside of the media cabinets you can mount items like your router or hooks for your wires to run through unnoticed. If you’ve got a good tip for hiding wires, share it in the comments below.